For 2014 Subaru added a variation to the XV Crosstrek: A hybrid—the company's first. Our tester, which came in an appropriate shade of Plasma Green Pearl, could be the poster child for cars in Oregon and Washington. I mean really, a green Subaru Hybrid? Does it get any more Pacific Northwest than that? So does its green color live up to its "green" hybrid moniker? The Hybrid is powered by the same 2.0-liter boxer four-banger found in the non-hybrid Crosstrek, although with higher compression ratio and a few other bits. It, of course, has an electric motor for assist, too. That extra assist also translates to extra horsepower, to the tune of 160 vs 148 in non-hybrid models. As you may imagine, torque is also increased to 163 vs. 145 ft/lbs. The Crosstrek Hybrid weighs in at 3,484 lbs, up 309 lbs. from a CVT-equipped all-gas model. 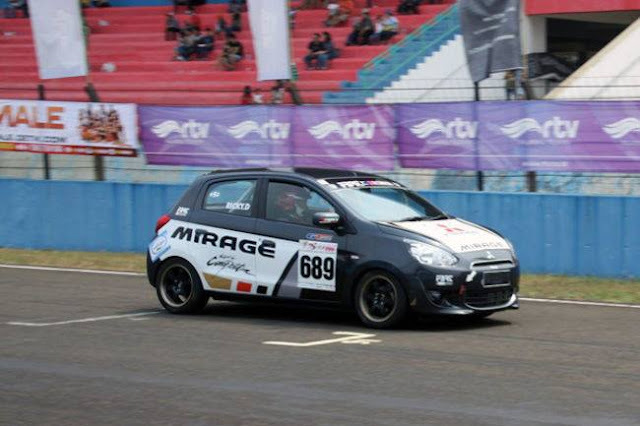 Electric motors make great torque, and that goes for the one in this car, too. Acceleration is noticeably stronger in the Hybrid model, which puts its power to all four wheels via a CVT. And yes, the car can drive in full-on EV mode, but only at speeds under 25 MPH or so. I found it difficult to keep it in EV mode, however; the gas engine wanted to kick in frequently. 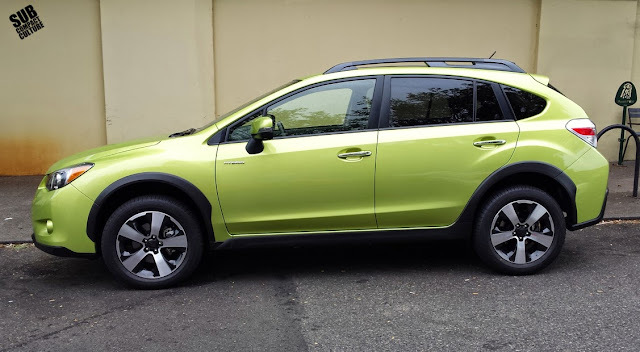 Short of that, overall drivability is better than the standard CVT-equipped Crosstrek, and most of that is due to the increase in power, Subaru tells me that the increased drivability is one of the reasons to get this over the non-hybrid. But what is the one thing people associate hybrid vehicles with? Fuel economy. 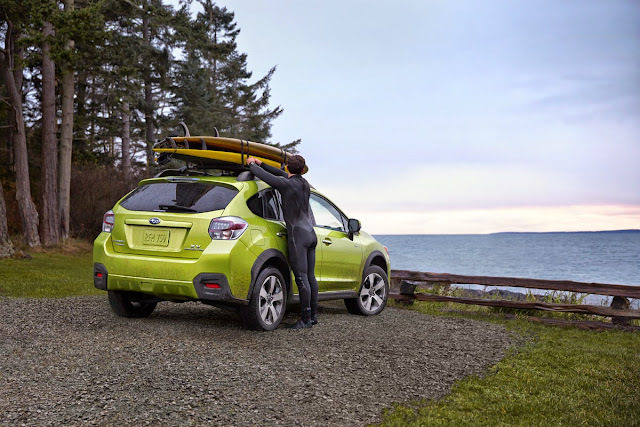 The XV Crosstrek Hybrid is EPA rated at 29 city 31 combined, and 33 highway MPG. Not stunned by Prius-like numbers? For comparison's sake, a standard CVT-equipped Crosstrek gets 25/28/33, respectively. Yes, they get the same highway MPG, but the city and combined are better with the Hybrid, although not astronomically. 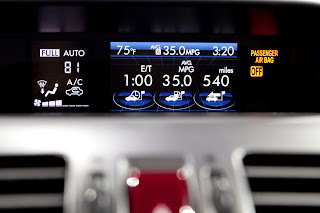 You do get more power, and all kinds of funky digital readouts with the Hybrid, as well as the ability to impress the folks at yoga class by saying you're driving a green Subaru Hybrid with AWD, mind you. And as stereotypical as that may be (especially here in Portland), there is probably something to it. For what it's worth, we put on over 600 miles on our tester and got about 30 combined MPG. So more power and more MPG—what's not to like? Frankly, not much except, well, the price. Our XV Crosstrek Hybrid tester came in at $26,820 (including destination), and this is not the upper-end Touring trim package. A similarly equipped gas XV Crosstrek goes for $22,980. According to FuelEconomy.gov, you're saving about $150 a year in fuel vs. the gas model. That's not exactly awe inspiring. However, you do get that extra bump in power, and we're the first to admit the gas model isn't rocket ship. So perhaps there are people out there that will pay the $3,840 premium for the power, with fuel economy will be icing on the cake. And for what it's worth, the 2015 XV Crosstrek Hybrid will get a 1 MPG bump in fuel economy, Subaru's Eye Sight driver-assist technology, and a new infotainment setup. Every time I drive a Crosstrek—Hybrid or not—I'm impressed by the comfort and the ability to really soak up bumps and bits of bad pavement. Combine this with the versatility and AWD, and the XV Crosstrek is still a winner in our books. 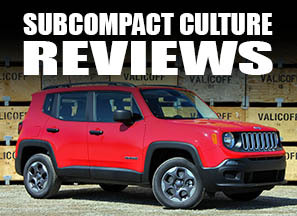 We love the extra clearance, the practicality, and overall personality. Whether buyers opt for the Hybrid or not will depend on their lust for more power, the size of their bank account, and if they want to be the most talked about thing since homebrewed kombucha. The price bump is a bit steep but you do get a 10% plus bump in around town and combined driving. That's not bad, especially since AWD does tend to lower your MPG to start with. I'd go for an Impreza base or sport hatch with the MT over any Crosstrek. Frankly, I just don't like the looks and was ready for the whole gray-cladding-pseudo SUV look to be over with a decade ago. I'd say "to each his own" but car manufacturers have a nasty tendency to stop pushing the non-Rubbermaid 5-doors followed by dropping them a few years later.